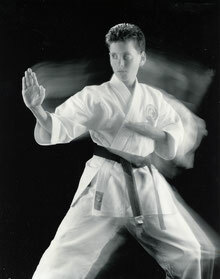 Mr. Kerrigan began his martial arts training in 1965 at a small school in Pittsburgh,PA. He later became the main instructor at that small school. In 1971 the school joined the All Japan Federation/Chito-kai. For the next 12 years Mr. Kerrigan traveled bimonthly to the headquarters 300 miles from Pittsburgh. These efforts, in addition to competing, judging, and coaching on a national and international level, resulted in him being the first individual in the Northeast U.S. to earn Yon-Dan (4th degree black belt) in the Chito-ryu style of karate. In 1983 Mr. Kerrigan met Osamu Ozawa, one of the founders of the world renowned Japan Karate Association (JKA), and most senior Japanese instructor in the Western Hemisphere. A short time later he was asked to join Ozawas' Traditional Karate International Confederation (TKIC). As a traditional karate-ka Mr. Kerrigan was required to start over as a white belt in the Shotokan style. He worked his way to Go-dan (5th degree black belt). After Ozawa Sensei's death (April 14, 1998), Mr. Kerrigan affiliated with the American Shotokan Karate Alliance (ASKA). In 2017 Mr. Kerrigan formed a partnership with Mumon Shotokan Karate (headed by Mr. Sadaharu Honda) to organize the American Budo Consortium . In 2002 Mr. Honda, with 60 years of martial arts experience, was recognized by the Japanese government as an 'Ambassador' of traditional culture & arts in the U.S.
Mr. Kerrigan has been fortunate to train, teach, and compete on 4 continents. He holds a class A instructors grading, and is a highly ranked examiner and judge, in addition to being the chairman and chief instructor of the Traditional Karate-do Association.